“…and Eris whose wrath is relentless, she is the sister and companion of murderous Ares, she who is only a little thing at the first, but thereafter grows until she strides on the earth with her head striking heaven. She then hurled down bitterness equally between both sides as she walked through the onslaught making men’s pain heavier.” Eris, also known as Strife or Discordia, and her friend or brother Ares, the god of war, walk through the world causing pain and destruction. They love to see people fighting with one another, they laugh on battlefields turned to mire with the blood of slain men, they yell horribly and happily across fields of wounded men, and taunt them back to the fighting so that they become corpses. Eris comes between friends and lovers, introducing jealousy, suspicion and doubt into happy relationships and turning them sour and broken. All of the creatures in Pandora’s box: scolding, despair, envy, gossip, distrust, drudgery, and–worst of all–false oaths, all of these creatures are children of Eris. The gods don’t like Eris, because she’s so unpleasant and nasty, they don’t invite her to their parties; but they use her. If somebody angers them, they’ll send Eris down to destroy their life and their love. Sometimes Eris is seen as valuable to men. She introduces the kind of dissatisfaction that makes a man work harder. She makes him feel insecure about his achievements compared to those of his neighbor and inspires him to become more industrious. But then potter fights with potter, farmer fights with farmer, carpenter fights with carpenter and everybody is miserable. Eris has apples of discord, and she throws these down to distract people and make them fight. If you ignore them they’re very small and harmless. But the more attention you pay them, the more you try to get rid of them, the larger they get, until they block your way entirely, or destroy you. I find Eris fascinating, and frighteningly recognizable. When I first read about her, I thought, “I know people like that.” I thought of people at my newly old job who lied and gossiped and stirred up trouble because they enjoyed the drama and knew that others did, too. I thought of countries who lied and spread fear so that they could provoke or justify war, for whatever evil and greedy reason they harbored. But maybe we all have a bit of Eris in us. We can blame it on her children, on envy or despair, or any other weakness and insecurity, but maybe everybody has a tendency to make things more difficult than they need to be from time to time. It’s a frightening idea. I suppose the thing to do when faced with an apple of discord is to pay it no attention, to not let yourself be sucked into a web of lies that grows more tangled and dangerous with each person to believe the stories and to spread them. It’s better not to feed the discontent, but to starve it by speaking the truth, and spreading kindness and encouragement instead of misery and strife. Or we’ll anger the gods and they’ll turn us all into birds! This genius idea was David’s. 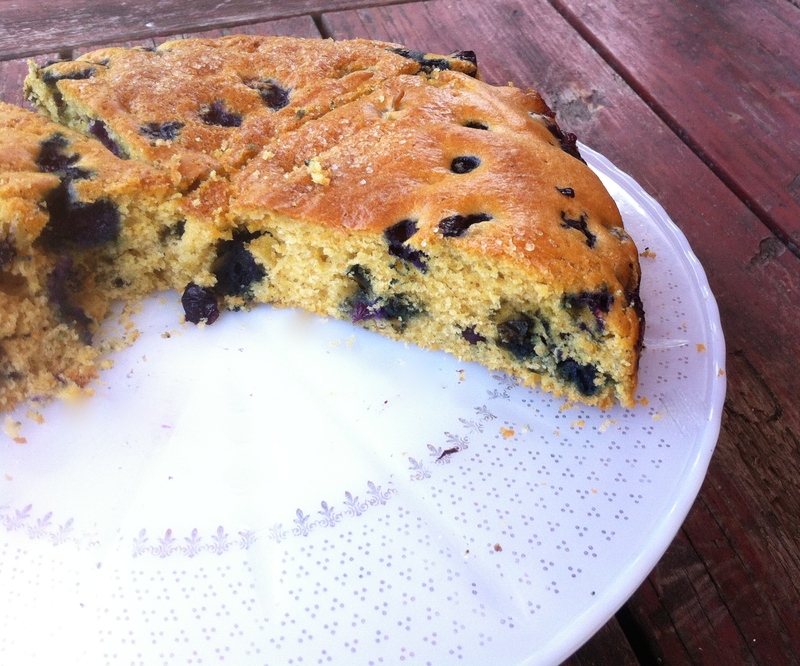 He thought that cornbread is sort of dry and almost crispy, and blueberries are soft and juicy. And they’re both sort of sweet-but-not-too-sweet, so they’d all go well together. And they do! This was a nice almost-a-cake kind of a bread. David made French toast with this one morning, and it was ridiculously good! Here’s Trouble by Cat Stevens. In a large bowl or food processor whisk together the olive oil, eggs, sugar and vanilla until frothy and well-blended. Add all of the dry ingredients and mix till you have a thickish batter. Add 1/2 cup milk and stir till everything is smooth. Stir in the blueberries. Sprinkle some coarse sugar on top. Bake for about twenty minutes, until puffed and golden and firm to the touch. Let cool, slice, and eat! 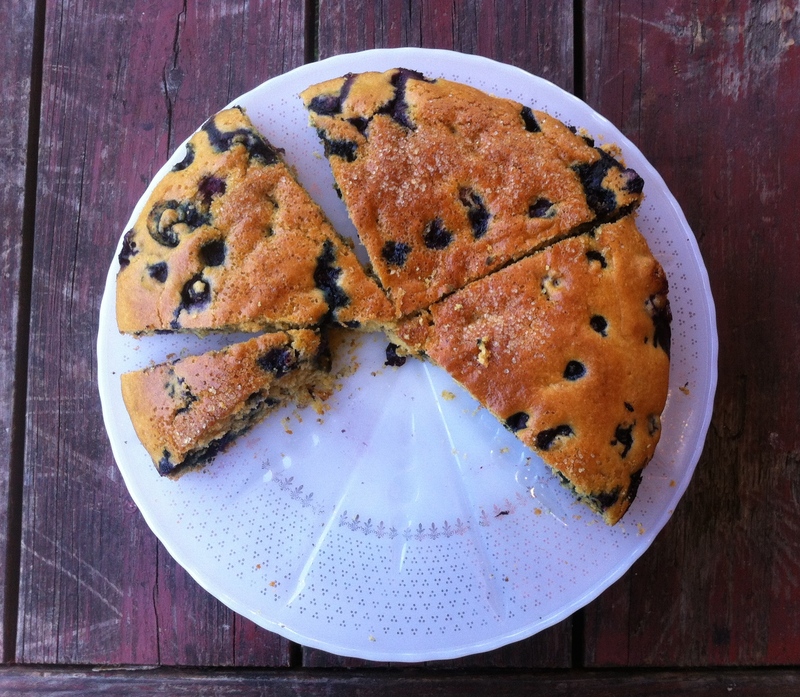 This entry was posted in bread, cake, recipe and tagged blueberry cake, blueberry corn, cornbread by Claire. Bookmark the permalink. – hmm, I wonder whether the local shop has blueberries? TFD, cornmeal called “polenta” in the UK?